You can see the lime tree from the boat! We love to eat out. It's our special treat once or twice a week. 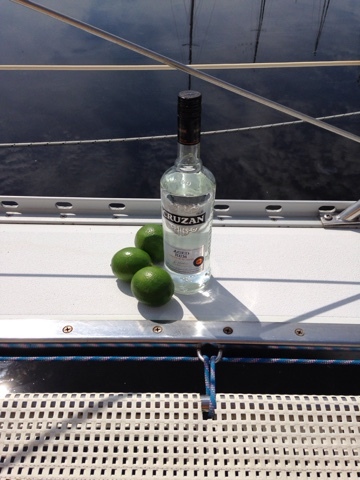 Not just for the food that we try to replicate back at the boat, but for the mixed drinks. We both love to cook, but I "google" the obscure recipes. The Captain has an advanced palate that can actually pick out individual flavors. He rarely uses a recipe. Mixed drinks are just more recipes that we can try to replicate. Yes, I enjoy the occasional glass of wine or Cosmo (Test your waiter by sitting as far from the bar as possible and see how far they can make it before spilling) but trying a new concoction is always more fun. We frequented BC's in O'Fallon, MO and they had a mixed drink menu that rotated with the season. We also had regular waiter's that recommended their favorites. It's where I had my first homemade lemoncello served as a shot in a glass of sparkling wine. Who knew?! It's became even more fun when I discovered the "off menu" drinks. Once you find a good bartender, they will serve you their previous specials or newest concoctions that haven't made the menu yet. The Captain has even been known to take a sip of my chocolate espresso martini (it's a specialty of Basil Thai in Brunswick, GA and is on their happy hour menu!). There's a bar in Petoskey that serves a green tea vodka martini (they'll serve it off menu, if they have any of the homemade syrup behind the bar). The Hemingway will always remind us of our time in Annapolis (Planes Boats & Bicycles "on-mooring-ball"). 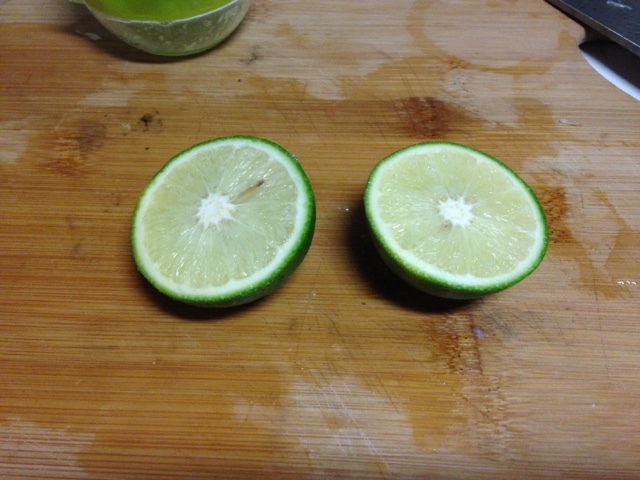 One of the things I've been looking forward to, as we headed south, was limes. I love lemons & limes. 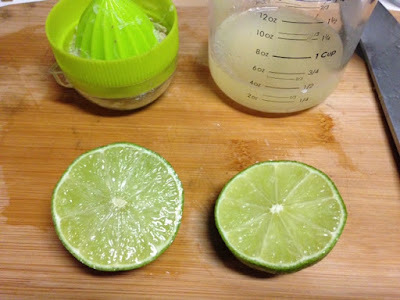 There is nothing more amazing than the smell of a fresh squeezed lemon or lime. I had heard tales of lime trees where you can just walk up & pick one! (Avocado & lime!!! Foodgasm) I was looking forward to that--and then a friend from our marina mentioned there was a lime tree on the property! Must. find. lime. tree. The Captain says, "Oh, yeah. There's one down by dock one." Dang. Off I went. There it was. I pass by it every day. I snuck a few in my pockets and headed back, running into my dock neighbor. 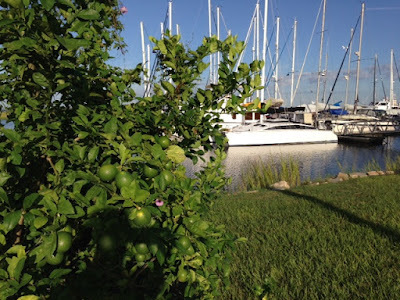 As I shared my secret, I glanced up and saw two small "trees"--bushes really, next to our dock. "It looks like that!" We run over. Two lime trees right next to our dock! I later discover two more trees and another dock neighbor says, "Are they ripe yet?" YOU KNEW?! Prior to researching sailboats a few years back, I had never read blogs. In fact, they had become annoying. It used to be, when you googled a recipe, your search results would be Allrecipes, Epicurious, Southern Living, Martha Stewart or NY Times. Now you have to wade through all the food blogs--because everyone has one (yes, this is a sailing blog with a "food" problem). Interestingly enough, there are very few copyrights, trademarks or patents for recipes (ie. Coca Cola yes. Emeril's Essence not anymore). 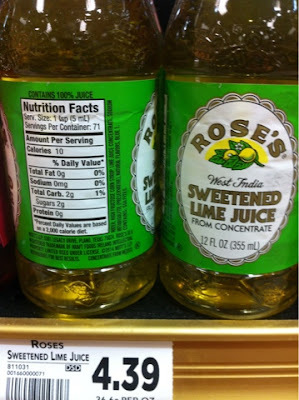 Technically, you would only have to modify an ingredient or two, which is what most blogs do. I prefer to cite the original recipe, since I frequently make things low-fat, low-sugar and gluten-free (not everyone appreciates my efforts, thus the original recipe). However, it's interesting to find there are many people/blogs like us, that don't just want the recipe, but the history and preferably original recipe to start, before we adjust for our taste. Simple Syrup: Bring 1 cup water & 1 cup sugar to a simmer. Stir until sugar dissolves. Allow to cool ($5 in the "mixer" or "coffee" section. I use "Sugar in the Raw". Still cheaper!). "High fructose corn syrup, lime juice concentrate...blue #1"
Lime infused vodka: I've found the whole "flavored" liquor fad annoying. If I want citrus in my vodka, I'll buy CITRUS. I don't want my vodka to taste like bubble gum or french toast & neither should you. (If you're drinking that, you should be arrested because you're probably not 21.) I've added whole vanilla beans to bottles of rum (although the Captain doesn't have enough patience for this). 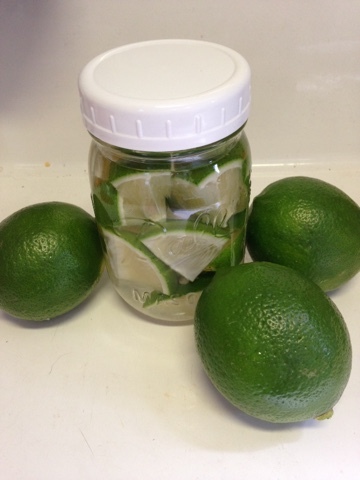 However, the dilemna of, "How can I take some of these limes with us," was solved with "lime-infused vodka" because vodka is a preservative :-) It doesn't require refrigeration. "Skinny" drinks: Ice, 2 oz clear liquor, fill glass with club soda (tonic has sugar), splash of "sweet"
So what happened to all the limes? Blend or shake in a small mason jar. If you like Pina Coladas, you can remove the fat by just using a good coconut rum (we like Cruzan) and a regular rum in any proportion that you enjoy. You are like a professor, Bonnie. Can I bring you an apple liqueur?